To SUCCEED in business today, you must be on the charge. You must have the TOOLS, INFORMATION and SUPPORT...to consistently yield exceptional results. You must be INSPIRED and MOTIVATED. The famous economist Joseph Schumpeter said - Successful entrepreneurs continuously look for better ways to satisfy their consumer base with improved quality, durability, service, and price which come to fruition in innovation with advanced technologies and organizational strategies. Your Essential Tools For achievement and innovation is a good place to start. Please click on the Image for your FREE copy. 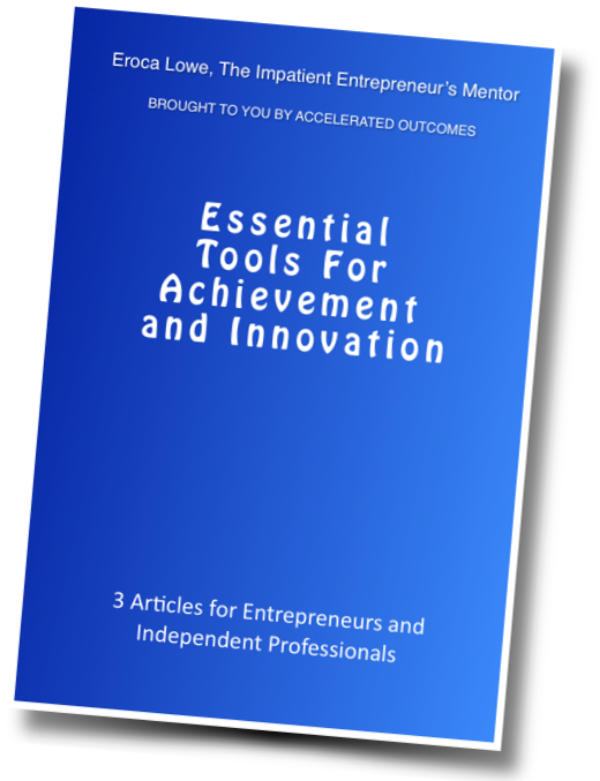 The Essential Tools for Achievement and Innovation gives Independent Professionals and Entrepreneurs a whole new perspective for achieving more in business. With this new perspective you will see what it actually takes to have impressive business results. The 3 articles in the package will give you tools to help you achieve more in less time, effectively plan for bigger results and understand why innovation is critical for business growth. We've put together this package so you can start working immediately with tools and ideas for achieveing more in your business. Based on our 25 years of experience of helping Entrepreneurs and Independent Professionals, it sets you on the path to more growth and more overall sucess in your business. We work with Business Professionals And Entrepreneurs who are up to big things and you are determined to achieve the plans and goals. We provide a unique and reliable set of tools through which clients identify the crucial and vital activities that are required for solid business management and growth. We tackle the issue of having a growing business and a balanced life. By specifically minimizing low-yield processes and habits while maximizing high-yield activities, business owners find it much easier to consistently produce optimal results.